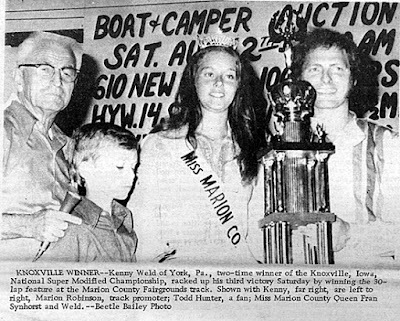 Knoxville, Iowa (August 12, 1972) – Kenny Weld of Thomasville, Pa., proved once more why he is one of the nation’s foremost super sprint pilots when he pushed his Floyd Trevis-built Wiekert Livestock machine to victory Saturday night in the 12th running of the National Super Modified Championships at the Marion County Fairgrounds. Following a rather long and frustrating evening of preliminary events, which found everything and anything happening on the track including the official flagman quitting during the middle of the program, Weld outran pole sitter Buddy Cochran from his outside front row starting position to grab the initial command of the 30-lap event on the half-mile black dirt oval. Weld was just starting to pull away from the field when a spectacular four-car accident forced the race to be red flagged on the third lap. Earl Wagner of Pleasantville, Iowa flipped for the second time in three days when he went over the top of Darrell Dockery, who also flipped his mount after making contact with a spinning Ray Lee Goodwin. Bill Utz was also involved in the melee and had his car burst into flames when its safety bladder burst. There were no injuries; however, all four cars were eliminated from competition. On the restart, 24-year-old Arizona sensation, Billy Shuman got past a sleeping Weld going down the backstretch to take the lead. Weld later commented that he had lost his rhythm and concentration during the red flag stop. 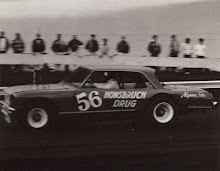 From that point Weld, who became the only three-time winner of the national crown, having won in 1964 and ’65, proceeded to open up over a full straightaway lead over the rest of the field. With Weld solidly in front, the crowd’s attention turned to the battle being waged between Shuman and Lonnie Jensen for the runner-up honors. 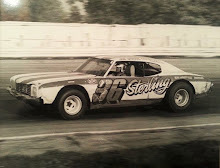 The pair hooked up in a tremendous duel exchanging the position on several occasions before Shuman took command for good on the 23rd go round. 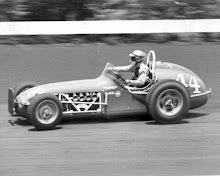 Finishing fourth was Eddie Leavitt, who charged all the way from his 17th starting position while former national champion Jay Woodside nailed down the fifth spot. Fast timer Buddy Cochran broke a sway bar and had to settle for a sixth place finish. 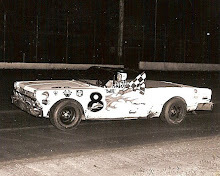 Rounding out the top 10 were David James, Ted Wise, Bob Williams and Rick Ferkel. Weld pocketed a check for nearly $4,000 out of a record purse of $22,000 for his efforts. In addition to winning the feature, Weld also won a semi-main and two heat races during the three days of competition. 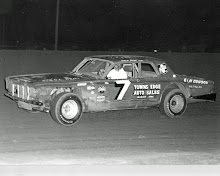 Roger Larson of Solomon, Kan., won the 20-lap B main as he outlasted Thad Dosher, Gene Genetten, Bob Moore and Dean Shirley. 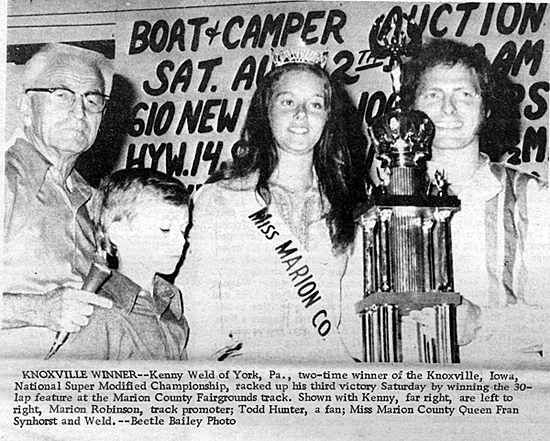 It seems the only person who was happy over the outcome of the 15-lap consolation event was winner Steve Ungar of Belpre, Ohio, as the race was marred by several accidents including a wild flip by Ralph Parkinson Sr. Saturday’s 10-lap heat races were won by Shuman, Weld, Woodside, and Bob Moore.